Spacious and airy cabin can accommodate 4 tall adults. Infotainment system needs a more responsive and more stable interface. Sometimes the problem with crossover hatchbacks is that despite the modifications they tend to look too much like the original cars. Thankfully, the new Honda WR-V can count itself in the exceptions category. Though it’s based on the Honda Jazz/Fit platform, the WR-V looks different enough from the hatch it’s derived from. The one aspect that seems to have had the biggest impact in creating the fresh look is the design of the bonnet that lends a sense of chunkiness to the silhouette of the WR-V. In addition to distinguishing it from the Jazz, it changes the stance from a pleasant face to a tall butch mug that’s all angles and highlighted by a bold chrome strip through the grill. There is a nice, not overdone, strip of side cladding that runs around the car blending in nicely with the front and rear bumpers. But, from the side the WR-V’s connection to the Jazz is unmistakable. The rear has also seen a few changes with a new set of tail lights that now creep horizontally into the lower portion of the bootlid. The bumper has also been re-designed. With these changes the dimensions have also changed and the WR-V is 44mm longer and 57mm taller than the Jazz down to the revised suspension and the longer front overhang. The wheelbase has also increased by 25mm and the ground clearance is 188mm, up from the Jazz’ 165mm. While its looks may be a little polarising, what is certain is that the designers at Honda have managed to make a crossover that looks very little like the hatch it’s based on. The Initial impression as you step into the WR-V is that it’s very attractive, even in this all black/grey interior. The dashboard is well laid out with the large central infotainment console and air con controls taking centerstage. The steering wheel is nice and grippy and features controls on either side for audio controls and Bluetooth phone controls. The quality of the plastics could still do with some improvement and we wish there was more use of soft touch plastics in the cabin (Most luxurious cabin in the segment? Read our WR-V vs i20 Active review). The front seats are quite comfortable and fairly supportive despite the somewhat soft cushioning. Getting the right seating position is made easier by the tilt and telescopic steering adjustment and the well placed central armrest. For passengers too it’s a comfortable place to sit in. The car boasts the largest knee room in its class showing that Honda’s ‘Man Maximum’ philosophy works in the real world. Even Tushar, who is six foot four, was comfortable in the rear seats and that’s not something he comes across often, as a passenger. While space is ample the rear seats are even softer than the Jazz and are not quite as supportive and there are also no adjustable headrests in the rear. Practicality wise there are a few nice touches with storage spaces for bottles in all four doors and there’s even a neat cup holder near the driver side AC vent to the right of the steering wheel that is great for cooling your hot cup of coffee. The one thing that magnifies the feeling of space is the large window area that makes you feel you’re entering a very spacious cabin. This does have one drawback and coupled with the lack of rear air con vents, the large windows have a greenhouse effect on really hot days and the WR-V does take a good while to cool down when parked out in the sun. The WR-V also misses out on the much loved ‘magic seats’ from the Jazz that would have allowed the rear bench to fold completely flat and improving the utility of the boot space. That said it still boasts one of the largest boots at 363 litres, yes that's a few litres more than the Jazz too! With competition high in the crossover market, you can bet that the top-end models get a generous sprinkle of all the bells and whistles. The WR-V is no exception, and the list on the top-end VX diesel that we had on test is the longest. Starting from keyless entry, push-button start and rear view camera, it goes on to include touch-sensitive climate controls, a sunroof and cruise control. The petrol VX, however, misses out on the push start, keyless smart remote and cruise control. The AC controls are quite difficult to accurately adjust on the move as the touch controls are quite sensitive and it takes some time to arrive at your desired mark. Everything else seems well thought out and there are even two 12v charging sockets to cater to everyone's charging needs on a long trip. It really does make you feel like you’d want for nothing if you decided to buy. Then there’s the 7-inch touchscreen multimedia infotainment system that takes centre stage on the dashboard. This sadly is a big let down with a very laggy and confusing interface that completely soured the whole ‘wow’ experience I initially had when I first stepped in. We actually spent over 20 minutes trying to adjust the equaliser setting and then gave up. I'm sure that a profession audiophile may be able to make sense out of the logic but in a car, while driving, you want an interface that is simple and easy to use. It also lacks the ease of use and functionality of Apple CarPlay or Android Auto so you’re stuck with the stock interface. Thumb the starter and the 1.5-litre diesel mill comes to life with just a hint of engine note audible inside the cabin at idle. It’s probably one of the nicest diesels to drive in town with a nice smooth and gentle power delivery. Overtakes on the highway need to be planned carefully. Overall you need to drive the WR-V in a calm and gentle fashion. That’s because even though the spec sheet will tell you this is the most powerful mill in the class, it tends to run out of steam higher up the rev range. When testing too, our fastest 0-100 time of 12.43s came from shifting up early nearer 4,000 rpm, when torque starts to trail off, rather than at the 5,000 rpm redline. It’s still one of the most linear diesel mills in the segment and for me, it’s one of the highlights of the car. If you can keep up this gentleness, then the Honda rewards you with some very impressive mileage figures. How does 25.88kmpl on the highway sound? Coupled with its fuel tank capacity of 40 litres, the WR-V boasts a possible range of over 1000 km. In our city mileage run, the results were a little lower than what we expected after that insane highway figure, but at 15.34kmpl it’s not something to complain about either. No doubt, the tall sixth gear is the reason for the great highway figure. Around town, the 1.2-litre petrol engine seems to make some sense. Driven sedately, it responds in a gentle fashion, not dissimilar to the diesel mill. Here too the 90PS on paper gets lost in tall gearing and lean burn technology. Step on the throttle and you find yourself wondering where that 90PS is made as you slowly gather speed. Out on the highway, overtakes need to be carefully planned and then you have to mash the throttle to the floor and wait for the petrol engine to pick up speed. Even passing slow-moving two-wheelers or autos in town requires a bit of throttle mashing and gear changing. As you can imagine, the fuel efficiency figures are on the impressive side. Figures of 17.34kmpl on the highway and 13.12kmpl are quite healthy. So whether you buy the diesel or the petrol engine should boil down to the economies of your usage rather than any endearing characteristics of either of the engines on offer. It’s quite the same case with the suspension which is excellent at city speeds and over the pothole-riddled roads, soaking up whatever the road has to throw at it. Both small imperfection in the road as well as large speed bumps are handled with barely any thunk or thud. For such a soft set up there is surprisingly little body roll too and that’s a welcome touch. But as the speed increases, a bounciness and side-to-side motion enters the equation that tends to tire occupants if the journey is long. The relaxed characteristics of the engine are reflected in rest of the controls too, with the light clutch and steering making for effortless progress through even the most annoying traffic. However, the brakes need some getting used to as the bite from them increases sharply when pressed harder. Nothing to be alarmed about since there is ABS to keep everything neat and tidy. This all sums up to a general lack of feeling if you’re trying to drive in a hurry and so it ie best to settle back to a more sedate pace to enjoy the WR-V feels best. The Honda WR-V features dual airbags, ABS and EBD as standard. In addition to this, it also features ‘Intelligent pedals’ or a brake override system allowing the brake to override the accelerator input if both pedals are pressed at the same time. The top-end petrol and diesel VX variants also get a reverse parking camera. There are two variants for both petrol and diesel-engined WR-Vs. An ‘S’ variant and a ‘VX’ variant that is the top of the line and the trim that you see in our test shoot. The top-end variant gets the 7-inch touchscreen infotainment system, 16-inch alloy wheels, climate control, rear parking camera and the motorised sunroof. 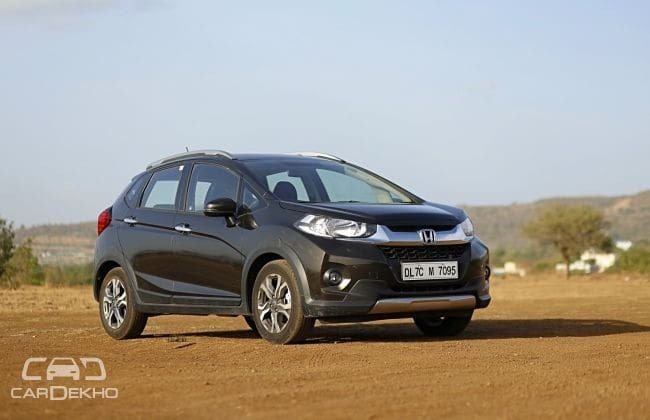 The diesel top end also gets a push-to-start button with Honda Smart Key System (Honda’s intelligent keyless entry technology) and cruise control, both missing in the petrol VX model. So, the WR-V starts off on the right foot by distinguishing itself from the Jazz. The interiors may lack some of the class compared to the likes of the i20, but despite the hard plastics, the design and layout of the interiors are pleasing to the eye. The space on offer too is great with heaps of rear knee room and a large boot. The added ground clearance and retuned suspension have increased this Honda’s rough-road ability. The petrol offers a sensible price point and adequate performance to navigate through the city. For those looking to clock more kilometres the diesel will be better suited. However, for those looking to drive longer distances and with more passengers on board the Jazz’s better back seat and suspension setup will make it the better Honda. However, the WR-V is very well suited for those looking for a rough road ready and city-friendly package to drive around town with that occasional long drive with the family.